In High School, having a thumpin' stereo in your car instantly elevated your social status to somewhere between drop out jock and FFA tough guy. As I shared a 1984 Honda Accord hatchback with my sister, investing money in a "system" would have been counter-productive. I don't think I could bear hearing Debbie Gibson at 130 Db as my sister rounded the corner to our house. I had a few friends who spent thousands on their "systems." I explicitly remember a friend who drove a hopped up Suzuki Samurai with every spare inch of space holding some kind of speaker. I actually think the frame was built out of large speakers. When we'd head to lunch, he'd pop in Naughty by Nature or a little Sir Mix a lot. At this point, the chaos would begin. It was like hitting Omaha beach taking enemy fire. Noises rushing by you, innards beginning to liquefy from the low-range frequencies, and a rear view mirror that was rendered utterly useless from the vibration. I loved the concept of the car "system," but did not like the ratio of bass to actual music. I like the bass...but also like to hear the music. My Samurai-driving friend was my polar opposite. If you couldn't hear him coming from 3 blocks away, it was time for an amp upgrade. 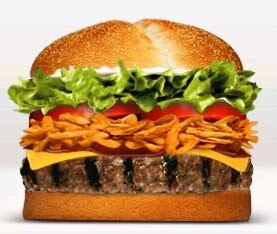 Having a really good car "system" is really how I view the Burger King A1 steakhouse XT burger. The ratio of this bad boy is completely out of whack. This bad boy burger has some real heft. I was surprised that Burger King didn't give this burger it's own box, and instead wrapped it in paper. I kind of feel that the quality of a burger increases 15% just by placing it in a cardboard box. Needless to say, it's got to weigh at least 8-12 ounces. But eventually, the heavy handed beef(like) patty started to become dangerously overpowering. Each ensuing bite became a marathon of chewing and eye-watering. It was the Suzuki Samurai all over again. The ratio of meat to other stuff was far too much, and I threw away the final third of the burger. I'm no light-weight, but the thought of eating another one of these quasi-meat patties again conjures up raw negative emotions. In retrospect, I should have known better. I have previously eaten one of McDonald's Angus burgers with similar results. (although they served theirs in a cardboard box) I shouldn't be buying Naughty by Nature when I'm more of a Foo Fighters kind of guy. 2 stars for initial palate pleasure and the ability to feel like I "won" by using a coupon. Hi there! Just wanted to say that I really enjoyed reading your blog. You have good insights. Thanks a lot for enriching with great information.